The Financial Times reports that it now has 250,000 digital subscribers — up 30 percent from a year ago. For about five of those 12 months, the FT has not been in the App Store, ditching the shop window of Apple’s iPad, iPhone and iPod eco-system and going it alone via mobile Safari with an mobile-optimized HTML5 web app. The London-based, famously pink broadsheet has always had a strict digital paywall which gave non-subscribers access to only a tiny handful of free stories during any given calendar month. When they released their app in July 2009 I was quite grumpy about how little it offered for free. But apart from the access debate the app did what it was supposed to by exploiting unique boundaries and navigation possibilities of the iPhone and later the iPad to organize the “site” in a user-friendly way. Last June, just as Apple was relenting a bit more on App Store restrictions that prevented publishers from freely marketing and upselling within their apps, the FT decided to break away and go all-in on the web. They built a site that was still subscription-only and which looked and felt every bit like an app. For the user (myself included) the experience was, if anything, better: Updates are dynamic when connected, even though the initial launch involves a download, just like an app — and speed is not sacrificed, to say the least. 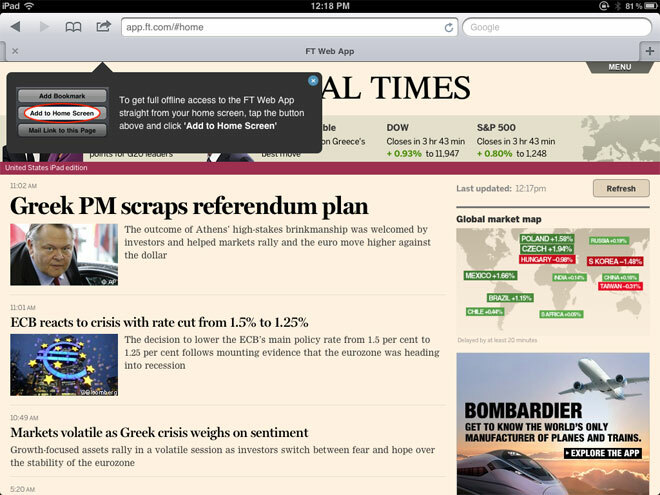 For the FT, the advantage is obvious: They don’t have to tithe 30 percent back to Apple for use of the App Store hall. So while it isn’t clear that the FT’s reach has improved by virtue of having no Apple ties other publishers will certainly note that it hasn’t suffered — unless one postulates that they might have done insanely better — say, 268 percent — if they were still in the fold.